Hobbies? Reading, singing, drinking coffee, hanging out with friends. What's your favorite class? Ethics with Dr. Cuddeback. It opened my eyes to a whole new way of looking at life. Do you play any sports? Not officially, although I have played on the Powder-Puff team and am presently on an intramural dodgeball team. Do you participate in any drama or music related activities? I am a member of the choir. What is your favorite thing about Christendom? I love how the Truth of the Catholic Faith is found everywhere on campus—from the people to the classes, the activities to the spiritual services offered by our chaplains. Why did you choose Christendom? It's part of my family tradition and I also knew that Christendom would give me the most complete and well-rounded conclusion to my formal education. Plans after graduation? Nothing definite yet, but i am sure God has great plans for me. Students gathered in St. Kilian's Café on Friday night for “Movie Night with Walter,” and the 1941 film, Citizen Kane. 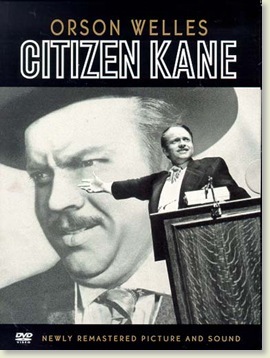 This dramatic movie is the story of Charles Foster Kane, a newspaper tycoon and millionaire, and a reporter's attempt to discover the meaning of his dying word, “rosebud.” It is an intriguing story of a man who came from nothing, and acquired fame and fortune, but died without the love he sought. Christendom's very own Walter Janaro, movie buff and film critic, was on hand to discuss the movie. Students further enjoyed their movie going experience with popcorn, candy, and drinks provided by the student activities council. “Movie Night With Walter” is the first installment of a six part series to be held during the Spring Semester. Each “Movie Night” will feature a different film voted on by students from the Vatican Best Films List. After the recent earthquake in Haiti, people everywhere have been inspired to help this poor country in need. Christendom students are also doing their part to help. 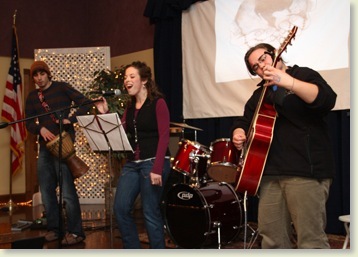 Last Saturday night, Outreach organized a fundraising concert to collect money to assist relief work in Haiti. 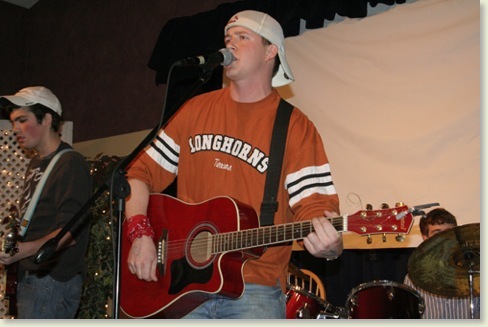 Featuring some of Christendom’s own musical talent, it included performances from the much-loved Nick Freeman and the Texas Heat. The evening began around seven, with Seniors Lancaster and Greene beginning the musical glory of the night. They were followed by Senior Anna Adams, who wowed the audience with her rich voice and great stage presence. 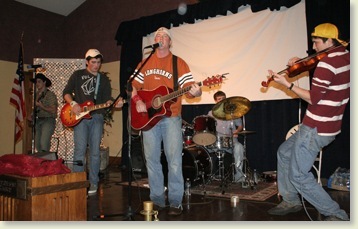 After a number of stellar acts, the feature of the evening arrived: Nick Freeman and the Texas Heat took the stage. Made up of Sophomores Troy Spring, Nick Freeman, James Hanon, Rory O’Donnell, and guest drummer Jacob Morgan, they played several country hits, including an encore of “Should Have Been a Cowboy”. 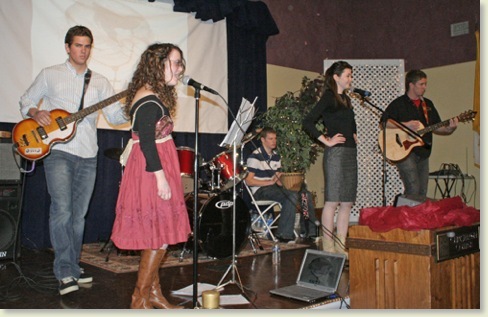 The attendance of the event was great, and after the performances Outreach leader Sarah Miranda took the stage to thank the participants who helped raise over 1,200 dollars for the relief effort that night. Find out more about the Student's Haitian Relief Fund and how you can contribute here. 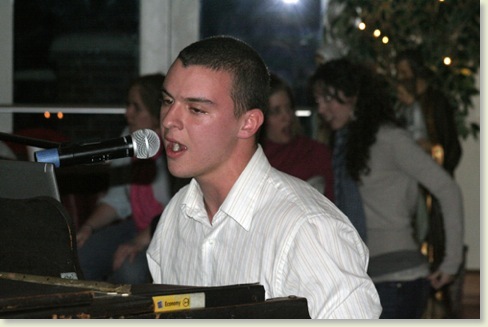 Sophomore piano whiz Matt Marchand performed a few covers while a slideshow of pictures from Haiti was projected on the stage. Sophomore Meghan Rubin performed a few originals on the piano, and was then joined by Sophomore Gabe Schuberg, Freshmen Dominic Ginski and Eric Maschue, as well as Juniors Catherine Briggs and Shelagh Bolger. 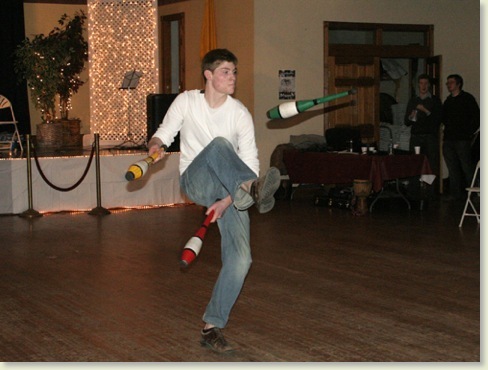 Sophomore Joe Long performed a brief but impressive juggling act. 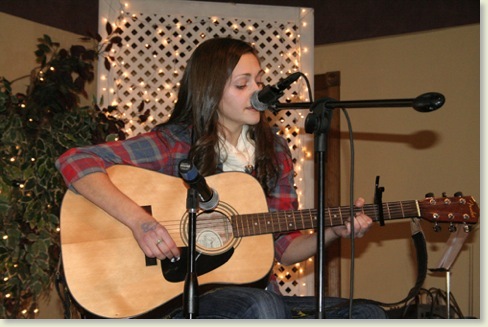 Freshman Theresa Lamirade played a few covers on the guitar, as well as an original song. The Syndicate of Dapper Gentleman featuring of Seniors Brian Gallagher and J.P. Minnick, energized the crowd. Junior Troy Spring led Texas Heat in a great performance. Event organizers: Seniors Chris Dayton, Sarah Miranda, and Brian Gallagher. 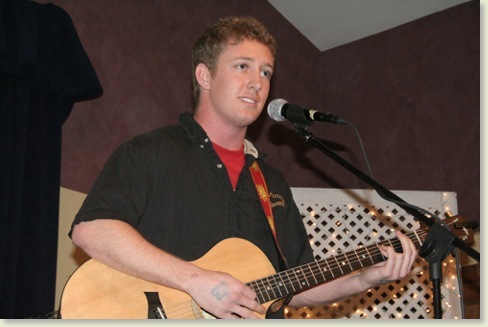 Check out more photos at Christendom's Picasa site! Monday afternoon eager listeners made their way to the Chapel Crypt to hear Dr. O’Donnell speak on Pope John Paul II. His lecture focused on how the late pontiff truly was a “great” pope, and that though the title was not officially given to him, it has been given to him by acclamation, for many reasons. Pope John Paul did many great things in our recent history, as Dr. O’Donnell pointed out: aiding the fall of communism, striving to unite the eastern Church with the Western, and working to truly bring the Church to the world as the vicar of Christ. He truly made the head of the Church visibly present on a universal spectrum in a way never done before. He saw many saints canonized and also beatified many holy men and women as well. His theological and philosophical works inspired many. These were just some of the many achievements of Pope John Paul that which Dr. O’Donnell touched on. 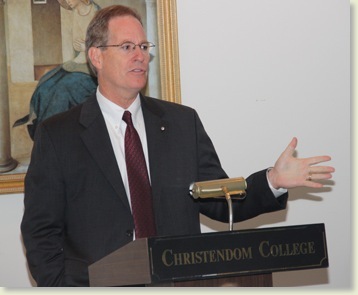 Dr. O’Donnell also spoke about his touching personal experience of and with Pope John Paul. 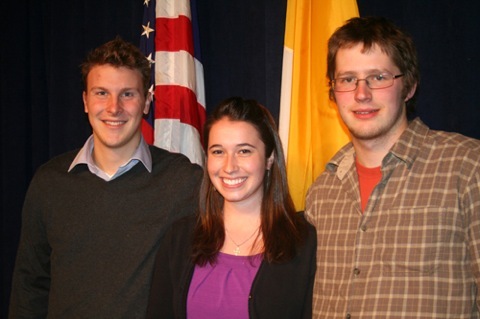 This talk was the first in a series of talks hosted by the Theology Department on Pope John Paul II. The next two will be given by Dr. Marshner, and Mrs. Stanford. 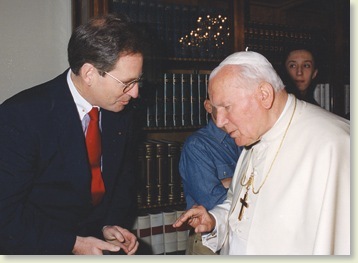 Pope Joun Paul II Meets with Students from Christendom in 1991. The club was started by Alumnus Danielle Lussier ('07), who saw a need for the club, and teamed up with Mrs. Wurtz (wife of former Dean of Student Life Joe Wurtz) to help at a Soup Kitchen. The idea spread and soon other students were joining them. 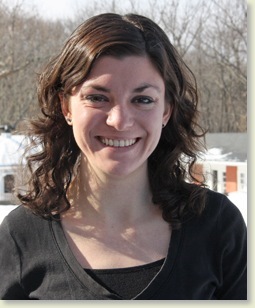 Cynthia Gilday (’08), got involved and soon Sarah became interested. “I started out as an assistant of sorts,” Sarah says. The club used to be named “Corporal Works of Mercy” but was renamed Outreach when Sarah assumed the role of leader. 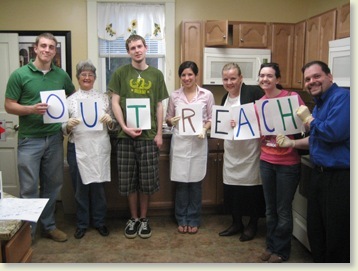 There are different activities in Outreach: Meals on Wheels, Soup Kitchen, both headed by Sarah; the Pregnancy Center, led by Sophomore Francis Dewey; the Habitat for Humanity, currently led by Junior Mike Inzeo, who is assisted by Junior Jack Donahue; the Nursing Home Visits, led by Senior Lindsey Mersch, and Advertising, done by Junior Allison Firehammer and Lauren Oligny. Outreach also does other projects, for example writing letters to the troops, making valentines for elderly, and having clothing/food drives for the needy. 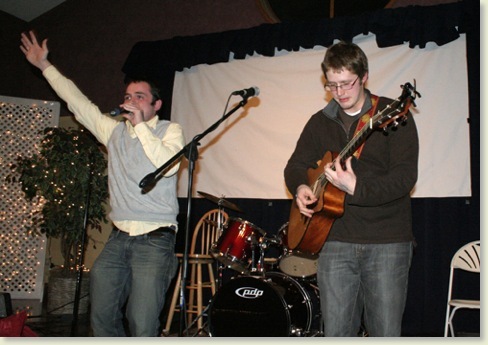 Their most recent accomplishment was heading up a concert to raise funds for the St. Francis Mission, to help out their relief work for Haiti, after the recent tragedy. See the story above. 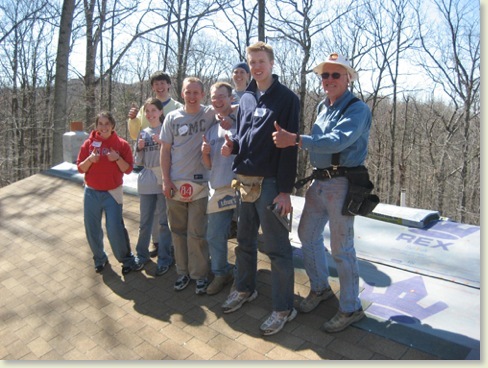 Outreach helps roof a house with Habitat for Humanity. 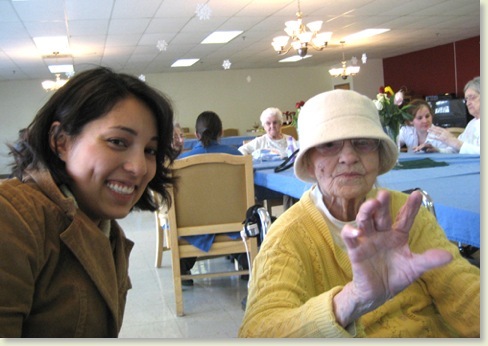 Senior Gemma Larcina and others members of Outreach give manicures to the elderly. Both the men’s and women’s basketball teams got in the win column this past week, with the men defeating Mid-Atlantic Christian University on Friday while the women defeated growing rival Patrick Henry College on Monday. The Crusaders started off red hot against Mid-Atlantic touting a 24-0 start to the game. The team defense was suffocating while everyone got involved on the offensive end. 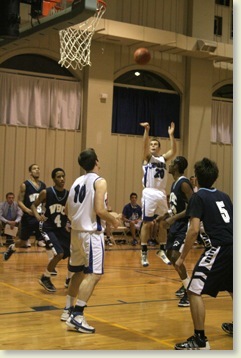 Brian Fox and Tim McPhee led the team in scoring while the Crusaders were able to get all 12 players in the game. The final score showed a 20+ point victory margin by the Crusaders. The men also played games against Washington Bible College, Patrick Henry College, and Valley Forge Military College this past week. 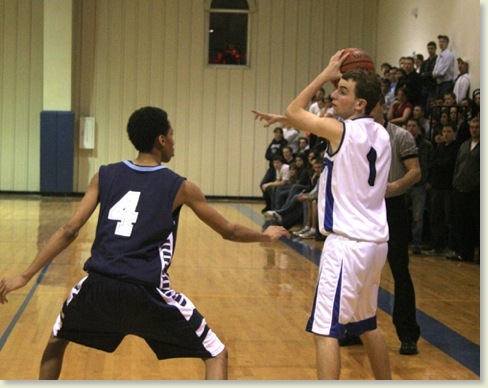 Although playing well in all the games, the Crusaders couldn’t secure a victory. 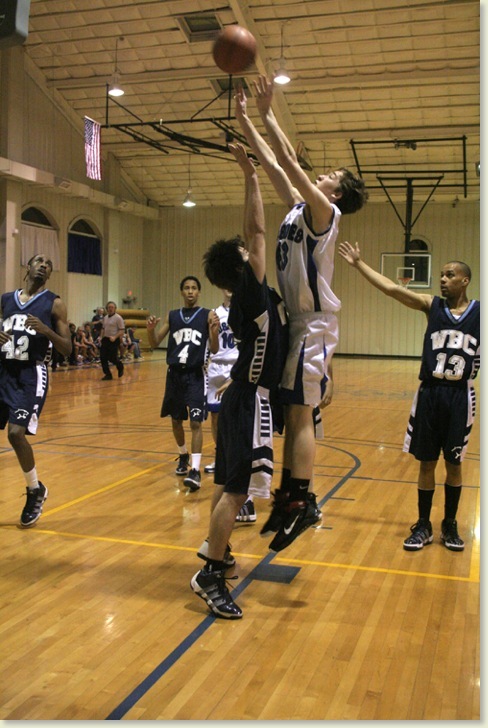 The Patrick Henry and Washington Bible games resulted in losses by 7 and 9 respectively. Freshman Tim McPhee has come on strong averaging over 15 points in the last 4 games, and finishing with a career high 23 against Valley Forge Military College. Matt Lancaster who has been in a shooting drought broke out against Valley Forge Military College hitting 5 of 7 from the behind the 3 point arc. Four of which were consecutive in a stretch of the first half where the Crusaders cut the deficit from 18 to 6 in a matter of minutes. The Crusaders are off this weekend due to snow storm predictions and will be back in action on Monday against Gallaudet University at Crusader Gymnasium. The Lady Crusaders have been improving with each game they play. After suffering a hard loss to Trinity College (D.C) the team bounced back for a 40-30 victory of the Sentinels of Patrick Henry. Jane Snyder led all scorers in the contest. 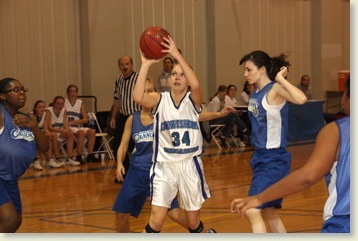 Jane has stepped up on the offensive end for the Lady Crusaders along with Meghan Kavanagh. The team has been taking lots of pride in their defense which stifled Patrick Henry to just mustering 30 points in the game. The Lady Crusaders played late last night against Penn State York and although playing tough defense the team lost to the team from York. The Lady Crusaders were scheduled to play Davis College this Friday but that game has been postponed to a later date due to the weather. The Lady Crusaders will play Gallaudet University on Monday at 6pm and will play the Championship of the Shenandoah Chesapeake Conference next Friday vs Patrick Henry College at 5pm in Purcellville, Va.
Tim McPhee looks for Brian Fox down low. Brendan Krebs adds two to the Crusaders' score. 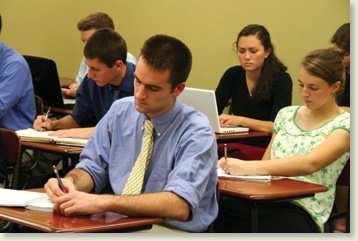 Q: What is a typical day at Christendom like? How many hours are spent in class, study, prayer, and free time? Monday through Friday: Mass is offered at 7:30 am. Breakfast is served from 7:45-8:30. Then classes begin at 8:30 (although you may not have a class at that time). On Mondays, Wednesdays, and Fridays classes are 50 minutes each. So, classes are from 8:30-9:20, 9:30-10:20, and then 10:30-11:20. Then everything stops and our community Mass is offered at 11:30am. (with confessions heard for a half hour prior to it and up until Communion time). Between the end of the 7:30 Mass and the beginning of the 11:30 Mass we have Eucharistic Adoration where students sign up to adore Christ in the Blessed Sacrament in half hour increments. Following Mass is lunch which is served from 11:45-12:45pm. Then classes resume from 1-1:50, 2-2:50 and 3-3:50. Dinner is then served from 5:15-6:00 and then Evening Prayer and Rosary is said in community in the Chapel at 6:15 with confessions heard from 5:45-6:30pm. Then, there are a couple of classes offered at night, but normally they are upper division classes for Juniors and Seniors. On Tuesdays and Thursdays, classes are 1 hour and 15 mins long. Classes go from 8:30am-9:45am, 10-11:15, 1-2:15, 2:30-3:45, and 4-5:15. Other than that everything is as listed above.